Cleo, I stated on my last reply (map and photo) it is Douglas Gandy's clog making shop!. Shoot! I missed that bit but of course it was Gandy's. I should have remembered that, the times I had looked at the clogs in the window, especially the tiny pair which fascinated me. 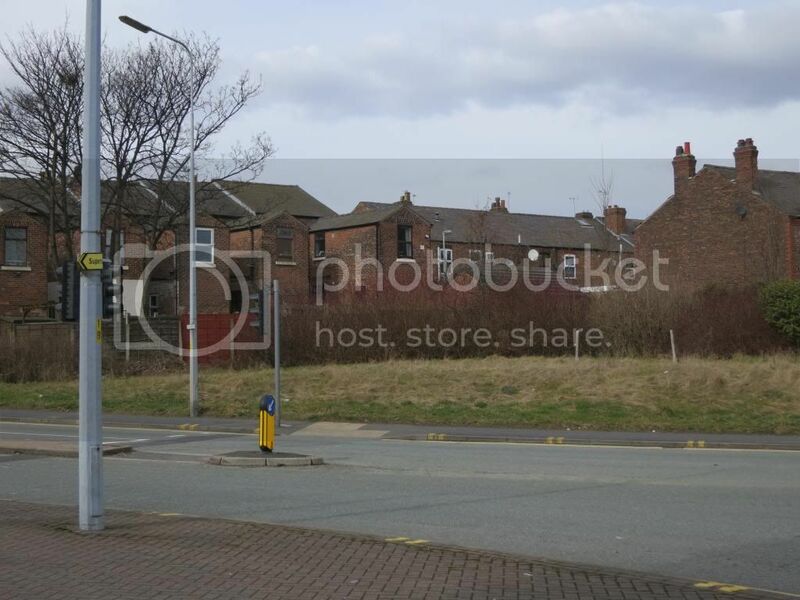 Approximate position of the Legh Arms in todays world, along Mersey St just past the job centre building. Graz it was in Mersey Street at the bottom of Rose & Crown Street, I have marked your photo and the map under it should help get your bearings. The shop on the right, boarded up was Douglas Gandy's the clog maker. Imagining where this one was is easier to place due to the distinctive curved fronted building that was once Ryland's Labs. Opposite the petrol station entrance at Sainsbury's. It's a pity its just grassy nothingness now. 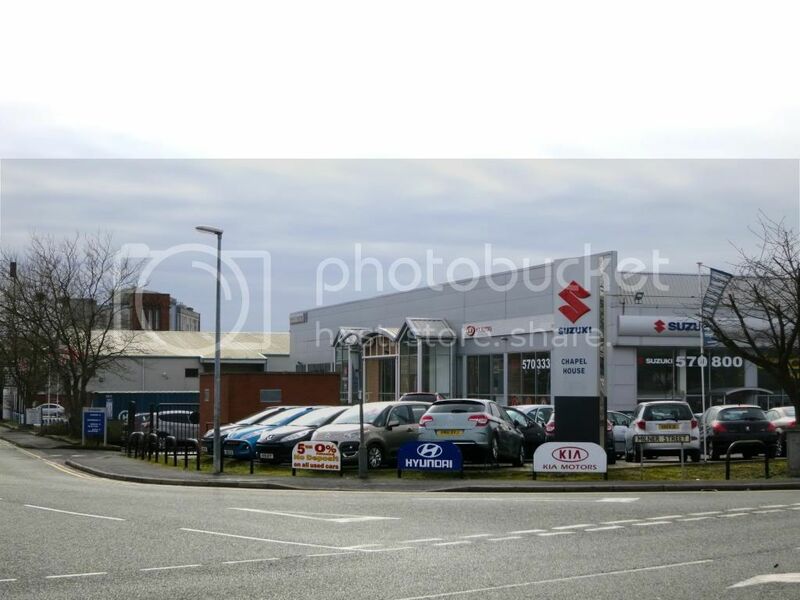 Opposite Rock Oil and the Honda showroom (Thanks Algy). Just on the off chance you weren't sure, here it is in 1890. Yes i remember that Nabber... it always made me wonder how they managed to get it printed & out on the streets so quick . It was the Football Pink, from the same stable as the Manchester Evening News. The sellers used to shout, "half time scores, racing resultsahhh"
The Roebuck, 120 Bridge Street, now a bar/nightclub. this Inn is mentioned in a 1794 Trade Directory of Warrington. (Photo-credit to John Hillier-Smyth). 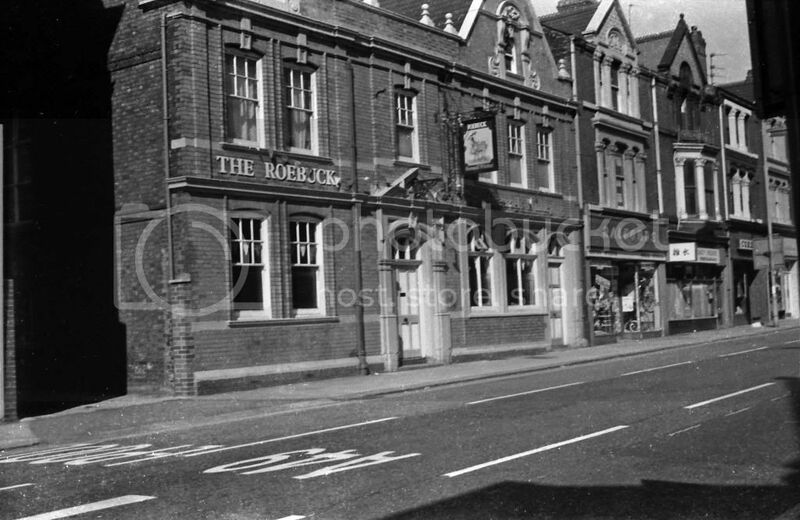 1890 - 1900 photo of the Roebuck, the building between the 'Singer's' sign and the clock. Here is my pic of the Roebuck from the 70's, in Greenalls livery. No wide angle lenses for me then, hence couldn't get a front on shot like the modern photo. I had forgotten the Halfords shop was next door. Graz, I am so pleased that you took that photo, That's the Roebuck as I remember it, I took my son and nephew to see the film "Convoy" at the Ritz and called for a swift pint before going in, I asked the landlord if it would be OK to take the lad's in and he really made them welcome, needless to say my son couldn't wait to tell his mum that he'd been in a pub, she played 'Hell' with me for taking them in. 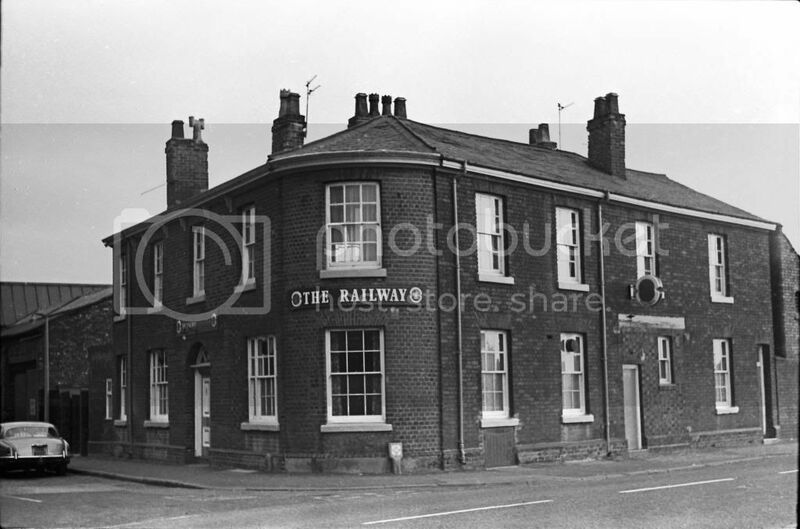 Does anyone have a picture of The Greyhound on Dallam Lane or The Bewsey Inn which was somewhere behind The Imperial ?? Got engaged in the Roebuck (didn't work lol) when Mike and Marlene Cleary had it. I too have not heard of these pubs, doesn't mean they didn't exist though, as Warrington still continues to surprise me!. Yes Algy I wouldn't say they didn't exist - my knowledge of that estate goes back nearly 40 years even though by then many of the old streets had gone and inhabitants gone to Orford or the post - War new Bewsey estates, Lovely Lane, Dallam etc. I am sure I would have known the Bewsey Inn as it was far easier for me to find a pub at lunchtime when collecting than to go home to Penketh and then back into Warrington. Strangely enough I have heard of the Bewsey inn. Was told that it was where the Thai bar was on Bewsey road but have no recollection of there ever being a pub there. Will ask around whilst walking the dog today, some of the people I bump into may know a bit more as they are of an age that may have come across it. Failing that will ask me mam as she was brought up in the area so will more than likely know where abouts it was. You've cracked it there Sid and now I do remember it. I think it was on Bewsey Road and in one of the houses the steelworks side of Cooper's Shop, more or less opposite Greenings. It might have been either 8 or 10 Bewsey Road and when I called there I think it was owned by a family called Riley. Notable for me as I was collecting there when I first heard of John Lennon's death. Think it is still there though don't know it's current usage. I remember Mr Cooper..... he always looked like he had died and come back as a zombie!!! They were both open in the mid sixties as I use to go in them prior to my Saturday evening disco at St Albans Youth Club on Bewsey Rd. The Greyhound was at the bottom of Dallam Lane roughly opposite The Three Pidgeons. 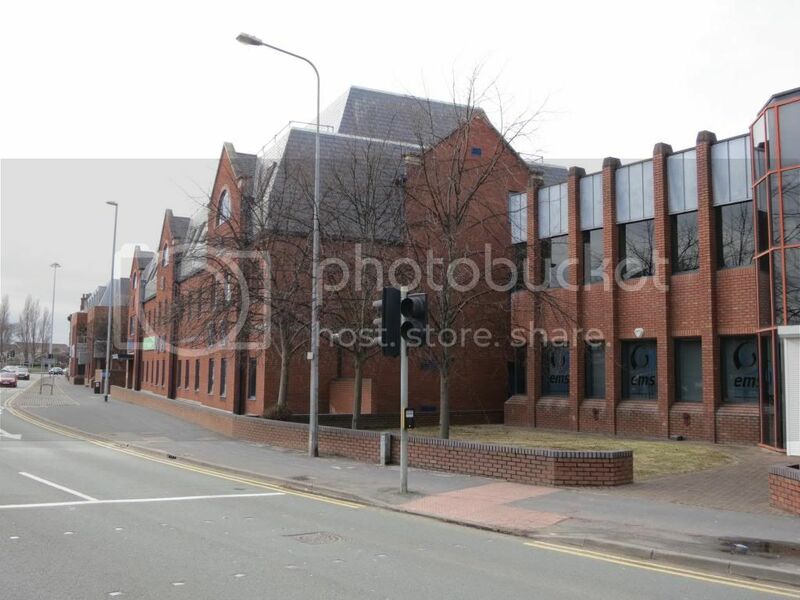 Were they new buildings or existing old buildings converted to pubs?. Wasn't the Dolphin there Sid? The Dolphin, wasn't that in either Lovely Lane or Folly Lane.